This blog is an update to the article I published on October 25th, 2016: How Worried Should You Be about Your Investments Now? The update is based on a review of the Financial Relativity Index metrics at market close at the end of October. The changing metrics are both interesting and potentially ominous given the breadth of historical data on which the model has been derived. 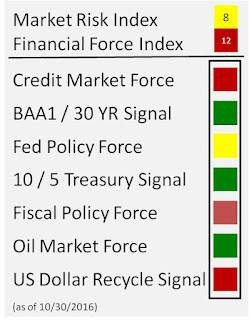 The two changes in the index since the end of September are an increase in market risk to cautionary from green light status, and a continued degradation of the credit market indicator. I wrote at length in my previous article on the credit market signal and how the deterioration in this particular metric has forewarned many business cycle driven economic downturns, and usually is a good leading indicator of a stock market correction. The focus of this update is on the sudden jump in market risk as measured by the Financial Relativity Index. Given the downward pattern which has formed off a new all-time high of 2190 in the S&P500 (SPX) on August 15, 2016, less than 3 months ago, there is a very good chance that the market is about to roll over into a much deeper decline for a much longer time period than it has in the previous 7 years. The perfect storm to bust the market bubble formed over the last seven years may now be in place. The Market Risk Index model I use as a major input in judging whether the stock market is about to correct is based on a number of technical measures. At the end of September the model did not show enough signs of an imminent breakdown, and on a scale of 1-20 showed a subdued risk of 4. 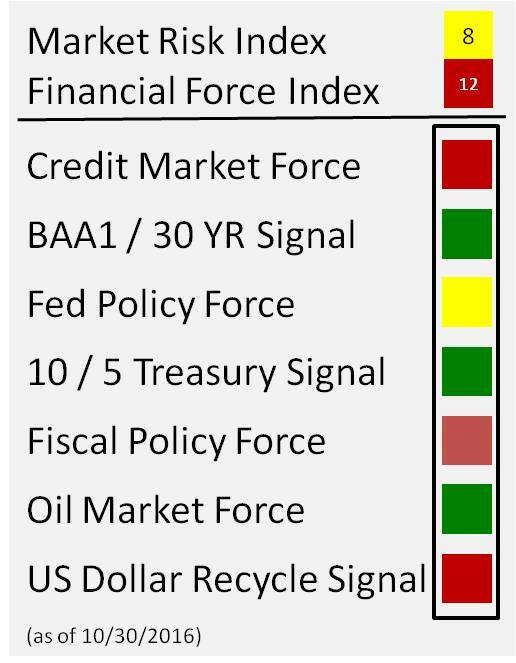 However, as my last article pointed out, the Financial Force Index I utilize to gauge market risk was not in-sync with the market risk measure. The difference in the measures may have been created because many investors waited until after the end of the 3rd quarter to assess their portfolios and implement changes. In addition, the US presidential election was 6 weeks away at the end of the 3rd quarter, and the perceived odds of a major financial market change at the time was low, as Hillary Clinton was already choosing new furniture for the White House for her arrival. However, the odds of a major disrupting financial change represented by Trump versus a more of the same Clinton presidency, appear be playing into the market odds-making machine as of early November. The election and its implication for fiscal and monetary policy, however, are not the only variables which are driving the markets increasing risk of a downturn. So, I warn investors not to be lulled into thinking the market is casting an electoral vote. The Financial Relativity Index is confirming that a a financial storm is in the works, regardless of who wins the White House. The model as of October 31, 2016 rose to a cautionary level of 8 on a scale of 20. The model reading is in between the 50th and 72nd percentile of back dated readings reaching back to 1956 (month end data-points). The technical reason that the model changed over the past month is highlighted in red. In simple terms, the rate of change in market growth over the recent past has slowed down substantially relative to the past 12 months. When this happens, the market is saying something is changing, and usually when it changes in a negative direction as quickly as it did in the past month, that something is not good for stocks going forward. Another concern I would note to investors at this time is that the stock market does not usually bounce off a low achieved in a previous correction, move to a new all-time high, and then show signs of a new correction, all within a 12 month time span. This rare pattern, however, is what investors presently are facing when reviewing the U.S. equity markets. Typical market recoveries post correction usually exhibit a long upward move in stocks of at least a 2-4 year time period before trouble for equities re-emerges. However, I suspect the market did not really find a fair value bottom in the last downturn. Instead, the combination of the Yellen Fed put, low energy prices, capital flowing into the U.S, from the EU and Japan due to NIRP and a mortgage sector move to free up lending requirements on mortgages gave the U.S. market life going into the 2016 Presidential election. However, most of these market stimuli are now either waning or even turning in the opposite direction. And now the market appears to be entering a tumultuous time period, similar to the early 1970s and early 1980s in which upsurges in the stock market are followed much quicker by downturns. The analog of today to the 70s for me is interesting. Back in the 70s and early 80s the U.S. market faced high inflation, high interest rates, high rates of government spending growth and a low national debt relative to GDP - the exact opposite of today. The reversal of the economic problems in the 70s required a major fiscal and monetary policy shift, which has culminated in the U.S. ending up on the opposite end of the scale on all of the these metrics over 40 years later. Although the times are diametrically opposite in so many ways economically, in my assessment, there is a high probability that the future path for stocks will be as tumultuous as the 70s as the extreme position of the current metrics reverse or as many say “revert to the mean”. Trying to hold off the reversal with government stimulus plans and targeting interest rates as in the 1970s is likely to cause the market to be range bound for many years, with recent highs possibly being territory not approached for the next decade. For those who remember the 1970s, the S&P500 reached 118 in December of 1972. This range was not broken through on a sustained basis again until the election year of 1980. The policy remedy that reversed the high interest rate, high inflation pattern of the 1970s created a volatile time for stocks in the early 1980s. However, eventually it created a long-term sustainable framework for equity growth. I fully expect that not dealing with current low rate, low inflation, high debt economy today would end up putting stocks into a zombie-like state with more down-turns than upturns, just like the 1970s; whereas, if policy decisions are made that reverse this path, I expect a more immediate downturn, but the creation of an environment where equities can move much higher in the future. In the Financial Relativity Index model, the usual market confirmation signal of a correction is a year over year collapse in returns to investors, almost always off within 2-3 months after reaching a new all-time high. The big moves downward have typically occurred after a quick spike in the market to a new all-time high, followed within 2-3 months by a down move that puts year-over-year returns in negative territory. This signature market phenomenon is explained in detail in my book, Theory of Financial Relativity. As of the end of October 2016 investors who bought the DOW market index (DJIA) 12 months ago made a small 2.9% return. Using the S&P500 as a measure, returns over the 12 month time period were only 2.3%. This puts the market on the cusp of the warning zone within just 3 months after achieving a new all-time high. What I have found is that the confirmation break-point in the market typically occurs when the month end year-over-year returns turn negative. The market, because it has an upward bias through time, rarely signals negative year-over year returns for any extended period of time unless it is about to undergo a full correction of 10% or greater. I wrote an article during the beginning of the last market correction in 2015 which explained this market signal. You can read this article entitled, “Dow Sends Rare Signal at August 2015 Month End Close” here. 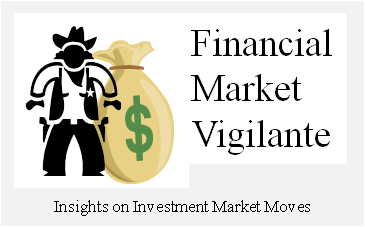 The year over year major market return decline pattern is a trusted signal savvy investors anticipate to tell them when it is time to get out of the major US equity markets. 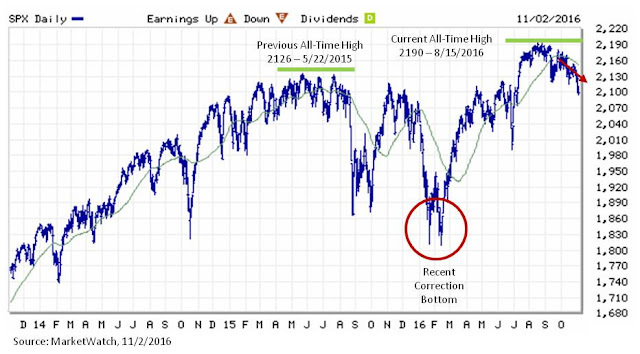 The signal in August 2015 confirmed a correction bottom that was reached in February of 2016. The Market Risk Index in the Financial Relativity Index was in warning territory at a value of 10 in June and July of 2015 prior to the 2015 early 2016 market correction. Based on month end close data, I estimate that the battle ground in November 2016 for whether the market is truly going to enter a major correction will be 17,720 on the DOW and 2080 on the S&P500. To signal a downturn in progress, the market needs to close below these levels and hold them through month end. The confirming signal would be a year end close below 17,425 on the DOW and 2044 on the S&P500. If the market breaks down below these levels going into year end 2016, I expect that the recent correction lows will be tested and broken, with a much deeper bottom eventually formed. The Financial Relativity Index now shows investors are becoming uneasy with their risk adjusted year over year returns. The changing appetite for U.S. equities coincides with a US presidential election. However, investors should not confuse cause and effect. The data show that the market is responding to negative forces of change which are likely to happening regardless of the election outcome. If Trump wins the presidency, which is now more likely than on October 25th, I expect the market to correct more quickly and deeply, as it did after the 1980 election. Such a correction would be triggered by the market pricing in the unknown effects of his proposed policy changes (or maybe just billionaires like George Soros hitting the sell button because their horse in the race to White House did not win). These policy changes, I expect, will begin to reverse the low interest rate, low inflation and high U.S. debt malaise that currently caps the US economy and by extension growth in US stock returns. Alternatively, if Clinton wins, the “more of the same” scenario for the stock market will likely resemble the range bound turmoil experience in the 1970s. 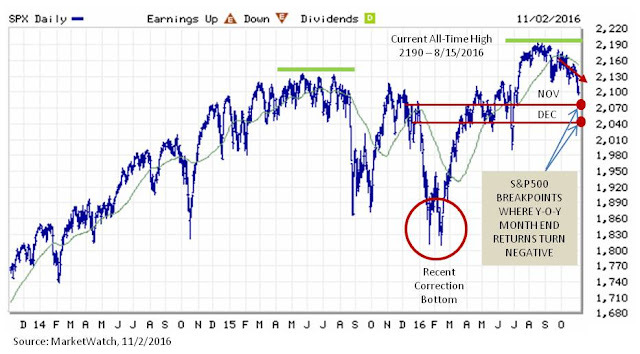 In either scenario, the intermediate term does not bode well for equity returns. Daniel Moore is the author of the book Theory of Financial Relativity: Unlocking Market Mysteries that will Make You a Better Investor. All opinions and analyses shared in this article are expressly his own, and intended for information purposes only and not advice to buy or sell. This Blog is really nice and helpful. We hope our post will be useful for all visitors of this prestigious blog.